'Dylan' (Larry Johnson, R. 2009). Seedling JO3-19. TB, 38" (97 cm), Midseason late bloom. 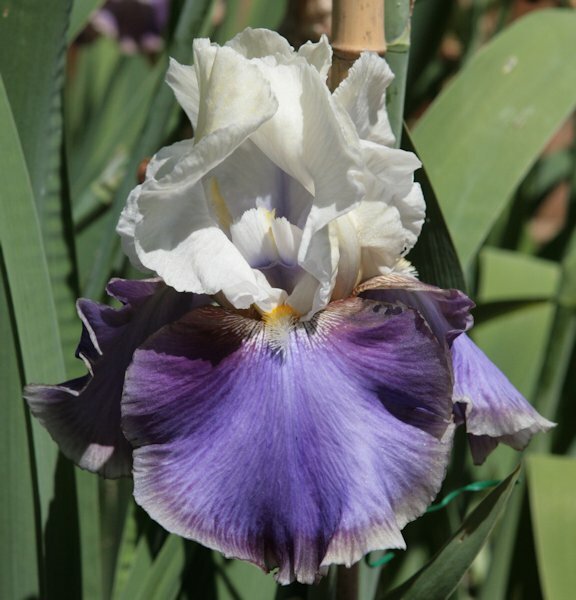 Standards pale creamy blue infused yellow; style arms purple and cream; falls purple center, brown shoulders wrapped with maroon, pale rim; beards yellow tipped white. Seedling JO98-1-6: ('Pheasant Feathers' x 'Island Dancer') X 'Dawning'. Cooley 2009. JPG DSCN0552.JPG manage 67 K 20 Apr 2010 - 22:55 Main.bjacobs Photo by Betty Jacobs. Picture taken at Cooley's Gardens.